Numerical weather prediction (NWP) forecasts are required for increasingly specialized applications, including providing detailed nowcasts for the surface transportation and renewable energy sectors. NCAR has the capability to meet those needs by enhancing community NWP models like the Weather Research and Forecasting model (WRF), and developing improved forecasting techniques that benefit the community as a whole. For surface transportation applications, specialized forecasts can help make vehicle travel safer. Vehicles collect a great deal of data, including some atmospheric variables, like air temperature and barometric pressure. If new vehicles in the consumer fleet were to report anonymized observations, that would provide an incredibly high-resolution set of observations (aggregated to every mile, every five minutes, over the entire road network nationwide) that could fill in some of the gaps in the traditional observation network. Could assimilation of this wealth of data into NWP models improve nowcasts beyond current capabilities? A pilot study conducted in 2015 with the WRF four-dimensional data assimilation (WRF-FDDA) system suggests that it can. For renewable energy applications, utility operators need precise forecasts of the power production to minimize the use of ancillary services and allow for more confident bids in the energy market, thus maximizing the exploitation of renewable resources. The importance of an accurate forecast is exemplified for the timing of ramp events, when a sudden increase or decrease in generated solar (or wind) power occurs because of sudden changes in cloud cover (or wind speed). At NCAR our scientists have been working to push the boundaries of NWP capabilities to provide much-improved forecasts of solar irradiance and energy generation. 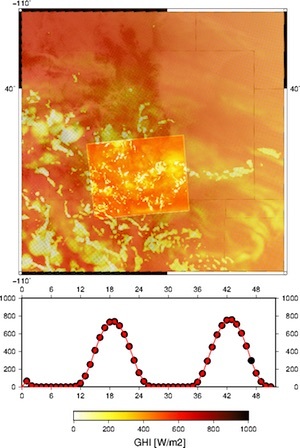 An enhanced version of the WRF model developed at NCAR, called WRF-Solar™, provides hour-ahead solar irradiance forecasts that are competitive with various persistence forecasting techniques, with forecasts out to the day-ahead range for energy trading and unit commitment. A nowcasting version of WRF-Solar provides 15-min irrandiance forecasts up to six hours ahead. WRF-Solar is the first NWP model specifically designed to meet the growing demand for specialized numerical forecast products for solar power applications.